This article may contain compensated links. For more information read our disclaimer here. 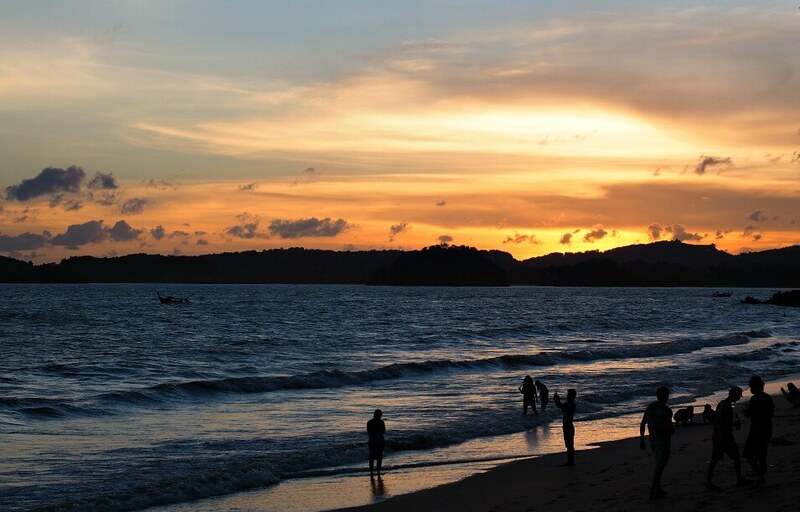 There are so many things to do in Ao Nang you’ll never get bored lazing on the beach. Or be left wondering what to do in Ao Nang. From snorkelling to rock climbing, kayaking and island hopping there are plenty of Ao Nang activities to keep you busy. Southern Thailand with its crystal clear water and powdery white sand is a beach lover’s paradise. And Ao Nang in Krabi Provence is no different. With limestone headlands at each end of its golden sand beach and stunning karst scenery, it’s one of the best places to go in Thailand. But if you’re looking for a remote beach where there’s only you and the coconuts then Ao Nang beach Krabi is not for you. Ao Nang town has a lively atmosphere and is geared up for tourists with shops, bars, and cafes. 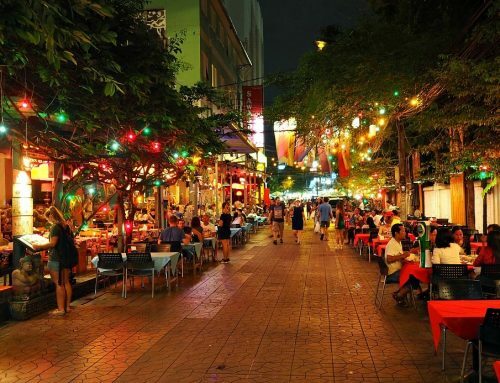 There’s plenty of Ao Nang nightlife to get your boogie on too. For more information and the latest prices on the best places to stay in Ao Nang click here. The pretty, palm-fringed Ao Nang Beach Thailand, is one of the best beaches in Krabi. And there’s no better way to start your Krabi trip than to spend a day lazing on the gently sloping sand. Soak up the sun while you sip on a fresh coconut. Then take a dip in the warm blue waters of Ao Nang Thailand. The majestic cliffs make a stunning backdrop as you splash around in the waves. If you have any leftover energy you can take a stroll along the golden shore. Or if you’re feeling really energetic – go for a jog. Ao Nang Thailand is the perfect jumping off point to the delightful islands of southern Thailand. 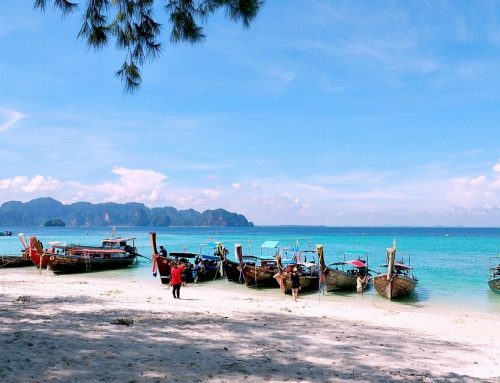 It’s where visitors come to enjoy some legendary Thailand island hopping. 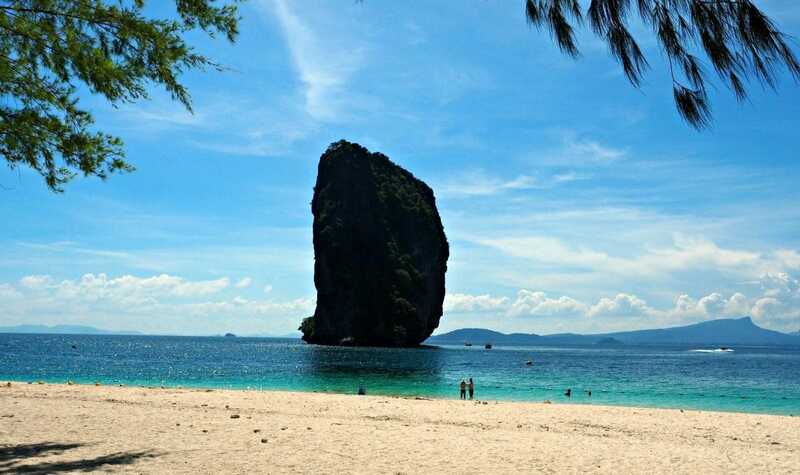 Many Ao Nang tours offer the popular 4 islands tour that visits the islands and beaches in the Krabi area. They’re definitely worth a visit and the 4 island Krabi tour is a great way to explore one of the top destinations in Thailand. You’ll be taken to tiny, picturesque Thai islands with the whitest of white sand and clear turquoise waters. Where you can swim and snorkel until your heart’s content. 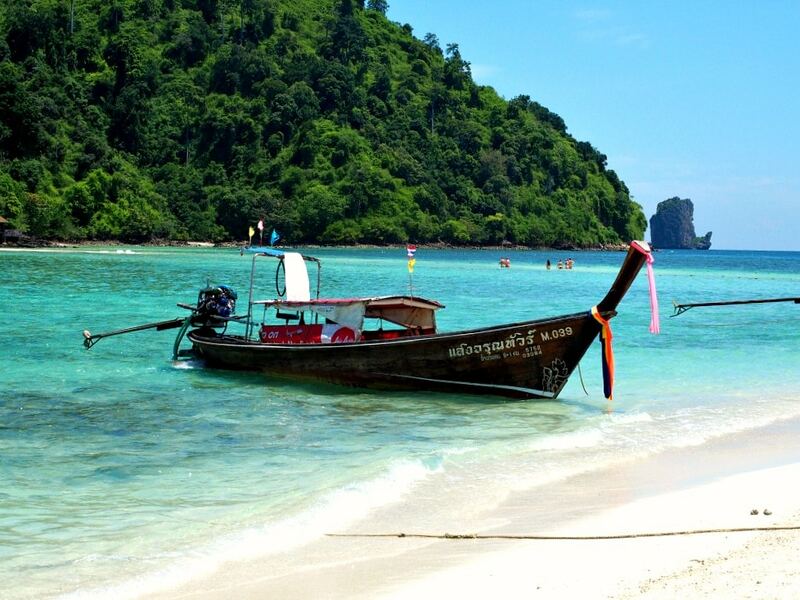 The 4 island tour visits Poda Island, Tub Island, Chicken Island, and Phra Nang Beach. A buffet lunch and drinking water is usually part of the package. 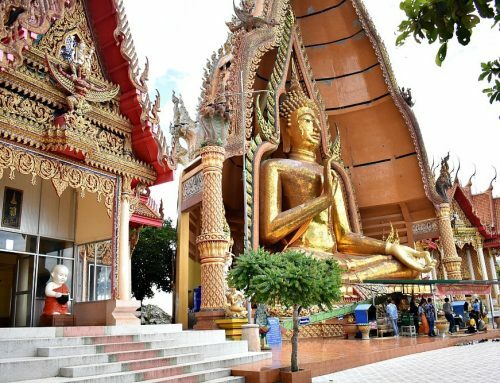 Most people visit Thailand to see the islands and beaches – although we love the temples too! And island tours are one of the top things to do in Thailand. But if you aren’t interested in all day Krabi tours then hop on a shared boat and visit one of the islands near Krabi. And enjoy the soft white sands and turquoise seas Thailand beaches are famous for. Ticket booths are found at each end of the main strip. It’s a good idea to arrive early as boats only leave when full. And this can take a looong time. The boat we wanted to catch to Poda island needed six passengers. Two people were already waiting when we arrived. But an hour later still waiting for one more person we gave up. Still keen for some island time we paid 2000 baht for a private boat to take us to two islands around Krabi. This price usually gets you 4 islands, but it was later in the day and the boatman had us over a barrel. We really wanted to go. In the end, we didn’t mind about the price as we had a fabulous day and the boat to ourselves. But if you’re travelling on a budget, you can cut costs by doing this with a group. It makes an excellent alternative to the Four Islands Tour. The only downside is it doesn’t include food. The boat stopped between islands so we could jump in for some snorkelling fun. The sea was alive with shimmering fish of every colour, we saw angel fish, sea anemones, barracuda, and others we didn’t recognise. Please note there’s a 400 baht Ao Nang National Park fee for the outlying islands. It’s one fee for all islands in the national park. This is on top of the cost of your boat. 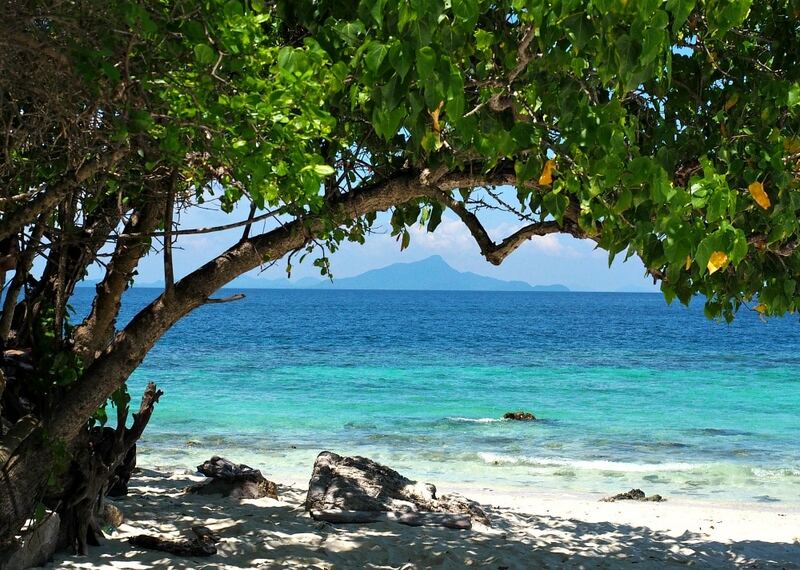 Koh Tub is also known as Koh Tup or Tup Island. There are actually two tiny islands here, Tub Island and Koh Mor. The two islands are joined together by a sandbar that’s fun to walk across during low tide. It was high tide when we visited but it was still possible to wade across to Mor Island. Five hundred metres away is the rock island of Koh Kai. It’s also called Chicken Island because of an oddly shaped rock formation. This island can also be reached on foot at low tide. Snorkelling is another popular activity on Tub Island Krabi. And we spotted colourful fish just paddling in the shallows. Apparently, Koh Tub’s summit has a great view of the surrounding islands but it was closed off when we were there. Hopefully, you’ll get a chance to climb it and tell us if it’s as good as they say. 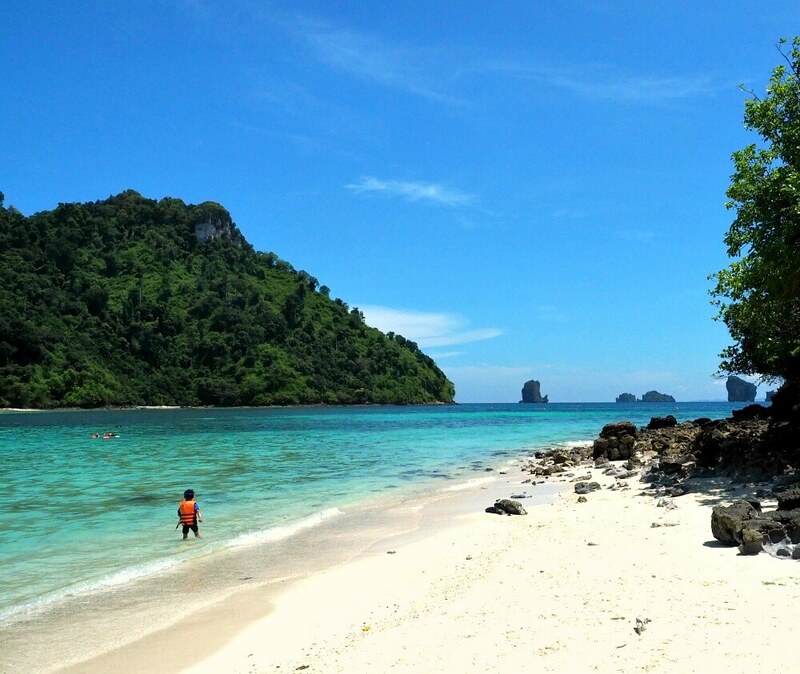 Covered with palm trees and surrounded by blinding white sand Poda Island is considered the best island in Krabi. Known for spectacular snorkelling, Koh Poda beach is idyllic with clear aquamarine water filled with dazzling fluorescent fish. If you find it crowded just walk further along the beach to a quiet spot where you can relax in your own island paradise. The island has a kiosk where you can quench your thirst or feed a growling stomach. We bought corn on the cob and were stunned when the stall holder splashed sea water all over it! But it was surprisingly tasty. Although Koh Poda Island is popular with day trippers it’s possible to stay on the island overnight at the Poda Island Resort. Once the boats have gone you’ll have Poda all to yourself with no cars, noise or mobile reception and only limited electricity. Each evening we’d sit on the seawall and watch the sun slowly sink below the horizon. We weren’t alone though, there were more people on the beach at sunset than during the day. But is it any wonder with nature putting on a stunning show like this? It’s also possible to do a Krabi sunset tour called the 7 Islands Tour. It’s basically the 4 Islands Tour renamed, except it leaves at lunchtime and arrives back around 8 or 9 p.m.
You get less time at the beaches on this tour and more time cruising. And it stops at a few of the rock islands along the way. For the more adventurous adrenalin junkies, the limestone cliffs in the Krabi area are known for some of the best rock climbing in South East Asia. And the spectacular coastal setting attracts climbers from all over the world. Circuits follow limestone crags, overhangs and hanging stalactites that are accessed by boat, jungle walk or by abseiling over the sea. This isn’t for the faint-hearted! Guided climbs and instruction are available in Ao Nang, Krabi Town and Railay East Beach. The Ao Nang archipelago has hundreds of gorgeous beaches, hidden coves and pretty tropical islands. A cheap and environmentally friendly way to see them is by kayak. Paddle out from Ao Nang to Railay beach and Tonsai, or if you’re feeling really active you can go all the way to Chicken Island. Just be prepared for sore arms the next day. Ouch! One and two-person kayaks are available for rent in Ao Nang for between 500 and 1000 baht a day. Railay is often mistaken for an island. It does look and feel like one but it’s actually part of the Thai mainland. The rugged natural environment has left the area without road access, so the only way in is by boat – adding to the island feel. Railay beach Krabi is covered in lush jungle and soaring cliffs with the warm Andaman sea lapping at its shore. And with so many things to do in Railay beach, it’s no wonder it’s one of the more popular places to visit in Southeast Asia. Hiking to Railay beach viewpoint. Swimming in Railay bay or Railay lagoon. Watching the sunset at Railay West beach. Watching the sunrise at Railay East beach. Visiting the Phallic Symbol Shrine at Phra Nang Cave. Yes, you read that right! Check out the fab video below to see how stunning Railay beach Thailand is. If you’d like to visit for longer than a day (and who wouldn’t?) there are plenty of Railay hotels at various prices to choose from. For information and the latest prices for the best Railay beach hotels click here. Attending a Muay Thai kickboxing match is one of the most action-packed things to do in Krabi Ao Nang. Muay Thai fighting uses fists, elbows, knees and shins, it’s fast-paced, hard-hitting and an electrifying spectacle! Tickets are available at most Ao Nang hotels and any of the tour agencies. If you have an hour to spare and are wondering what to do in Krabi, then a Thai massage is a delightful option. For about US$8 per hour, a Thai massage is an affordable way to loosen up tired stiff muscles. It’s also one of the most popular things to do in Thailand. Hidden away from all the tourists, and 15 minutes from town is the chilled-out Andamana Beach Club. Located on the edge of a bay, surrounded by jungle and cliffs it’s perfect for sipping cocktails and lazing in hammocks. The vibe is slow and mellow and the only sound to be heard is the gentle lapping of waves on the shore. A free shuttle service is available from Ao Nang to Andamana Beach Club. The buses leave from outside Alisea Boutique Hotel and Ao Nang Cliff Beach Resort. The hotels in Krabi Ao Nang beach suit all budgets. And it’s possible to find good value Ao Nang accommodation, especially in the mid-price and luxury ranges. For those looking to be close to the action, the Ao Nang beach hotels along the main strip are a lively option. If you look further inland you’ll find quiet places to stay in pretty locations for a relaxed Aonang hotel experience. Here are some Ao Nang Thailand hotels for you to take a look at. Snuggled up in the hills Ao Nang Cliff Beach Resort has panoramic views over the shimmering waters of the Andaman sea. And yet it’s conveniently located in the heart of Ao Nang with everything right on your doorstep. A fabulous feature of the resort is the stunning infinity pool and its incredible views over the bay. Rooms are well-equipped but for some real luxury, the Ocean View rooms and Panorama suites come with a bathtub on the balcony. For more information and the latest prices for Ao Nang Cliff Beach Resort click here. Not to be confused with Ao Nang Cliff Beach Resort, Ao Nang Cliff View Resort offers rustic-style bungalows nestled in tropical greenery. The resort is surrounded by nature with the Ao Nang’s famous cliffs as a backdrop. Guests delight in the outdoor pool where you can see monkeys jumping on the cliff while you have a swim. Other facilities include a sauna and small gym. They also have a tasty buffet breakfast where you can have your eggs made to order. For more information and the latest prices for Ao Nang Cliff View Resort click here. This great value boutique hotel is located between Ao Nang and Nopparat Thara beaches and has lovely sea views. One of the great things about this hotel is the free transport and complimentary access to their own private beach. The rooms are spacious and comfortable and the hotel has fast Wifi which is always a plus in my book. There’s a great local market right across the street. For more information and the latest prices for AliSea Boutique Hotel click here. 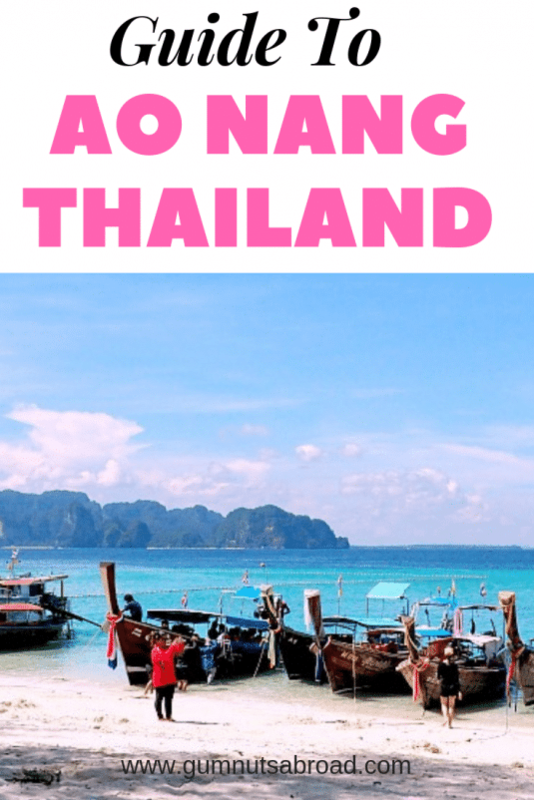 Ao Nang is relatively easy to get to with a well-organized transport system. We arrived by plane at Krabi International Airport and caught a shuttle bus direct to Ao Nang for 150 baht each. A taxi will set you back around 600 baht. Popular destinations can be reached by bus, or ferry if you’re island bound. The easiest option is to book through a travel agent. They’ll arrange for pick up at your hotel by minibus, and transfer you to a larger bus or ferry to your destination. We caught an overnight sleeper train to Bangkok. There aren’t any train services in Ao Nang the closest station is in Surathani. To get there we had to catch a minibus to Krabi Town then a bigger bus to Surathani where we caught our train. We used a travel agent in Ao Nang which made the process easy and stress-free. It cost 558 baht each for both buses and our 2nd class train sleepers. For more information and the latest prices on the best place to stay in Ao Nang Krabi click here. 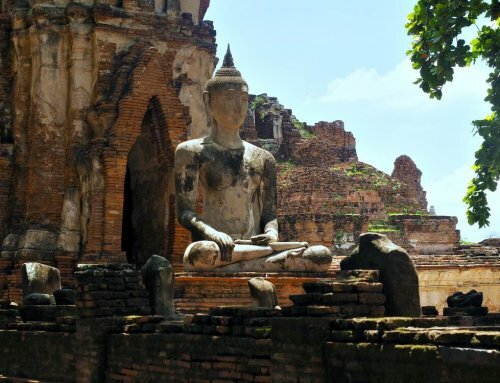 If you’re visiting Thailand then check out these other articles we wrote for some handy tips. Have any questions? Or something to add? Let us know in the comments below. Like This Post? Then Pin It! Pop your email in below and never miss a post. We won't flood your inbox. Promise! Audrey is a coffee drinking adventurer who has spent the last 30 years travelling with her partner Andrew. In 2017 they set off together on a 13-month career break to wander the world. She loves nothing better than helping others to follow in their footsteps. 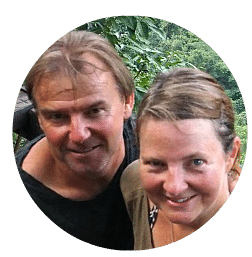 We’re Aussie Gen Xers on a twelve-month career break inspiring and helping other 50 somethings to travel the world. 55 Interesting Facts About El Salvador That Will Blow Your Mind!